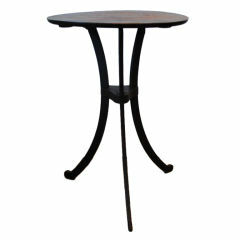 A unique Empire style mahogany side table or candle stand with an inset gray marble top and brass gallery, supported on a shaped column fixed to tripartite base sitting on acorn shape feet, France, circa 1840. 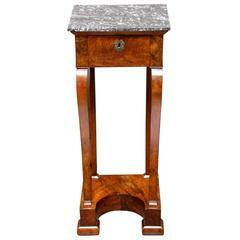 An Empire style mahogany side table with dark green marble top and brass-mounted columns. Unusual Empire Revival style mahogany and walnut side table with inlay detail and brass mounts. In excellent restored condition, France, late 19th-early 20th century. 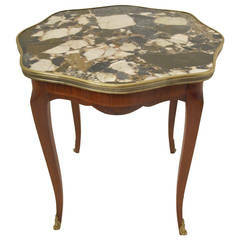 Italian Breche de Alp marble-top table with brass trimmed edge on cabriole legs with brass sabots. Mahogany with satinwood inlay. Italian, 1950s. French mahogany marble top dumbwaiter / two-tier side table with brass gallery. Custom quality with pieced bronze galleried shelves. 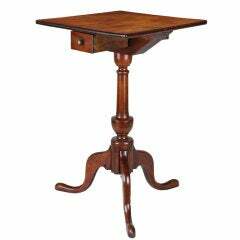 A French Charles X mahogany table, candle stand with a marble top. 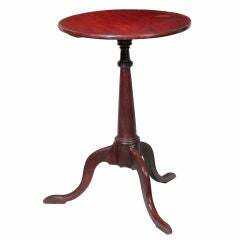 A rare and unusual oval candle Stand retaining its original surface from New England.